I know everyone is baking up a storm in their kitchen for the holiday festivities and I’m running behind! I wanted to post one last Thanksgiving related recipe before moving on to the Christmas holidays. Yes, I’m totally irrelevant. Please don’t mock me. We had a lot of stuffing leftover from our T-Day feast so I decided to make some breakfast out of it. I know as a food blogger you should make things from scratch or at least semi-homemade. The stuffing this year came straight out of a box and we had a lot of leftovers —figures! But that’s OK. It made for the perfect breakfast item the next day. 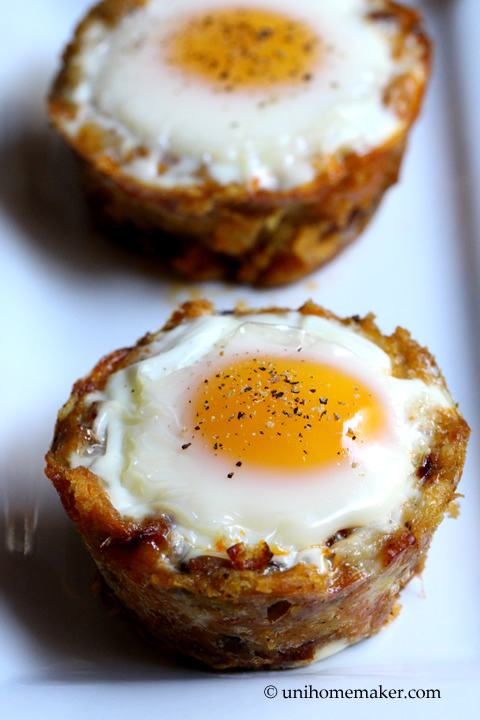 If you’re looking for new ways to make eggs, you’ll want to check this recipe out. Happy Tuesday! 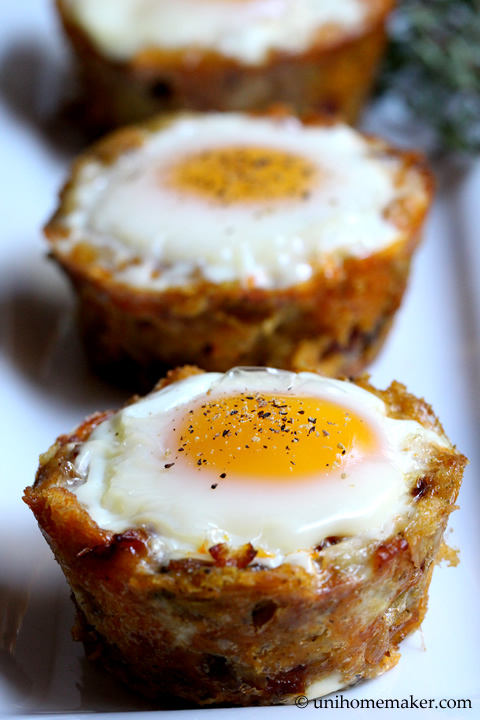 Preheat the oven to 350 degrees F. Grease 6-8 baking cups of a standard size muffin pan. In a medium skillet over medium heat, sauté chorizo and onion in a little bit of olive oil. Cook until onions soften, about 3-5 minutes. Then add stuffing. Stir to combine. Your stuffing should have a bit of red color from the chorizo fat. Remove from heat and let it cool for 5-10 minutes or until it’s safe to handle with your hands. Spoon stuffing into each baking cups. Using your fingers to pat down the stuffing to cover all surface area in each cup. 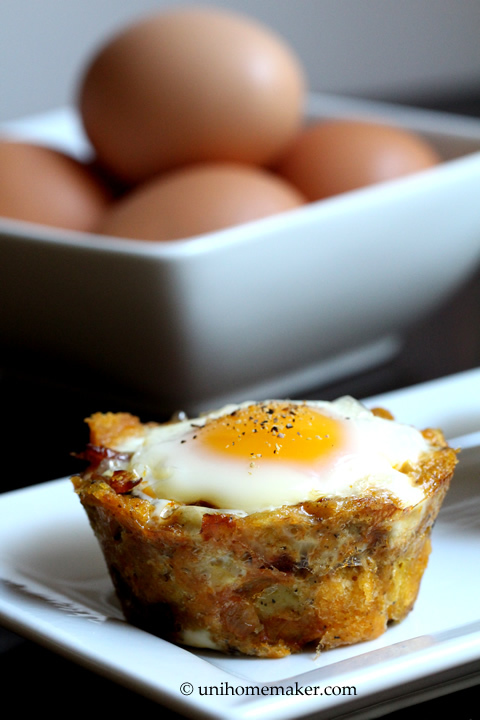 Make sure there is no excess stuffing in each cup or your eggs will overflow. Crack an egg into each cup. Bake for 20-22 minutes or until desired doneness. Let it rest for 10-15 minutes before removing them from the muffin pan. Use a butter knife to loosen the edges in a sawing motion. Then use a fork and the butter knife together and gently remove each egg cups from the pan. Sprinkle some freshly cracked pepper on top before serving. 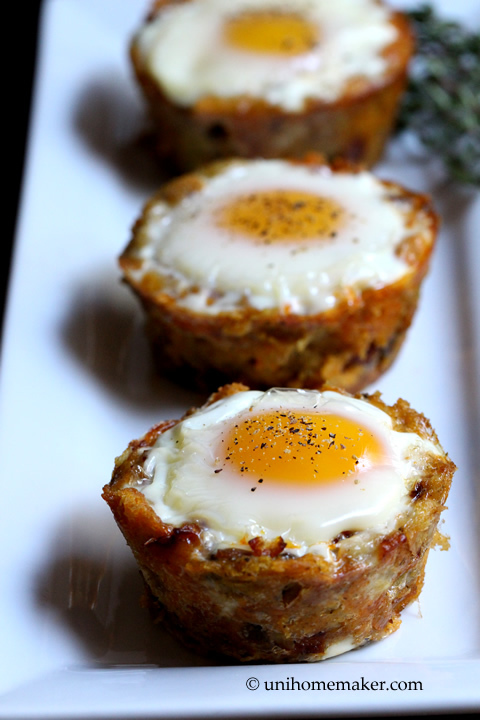 We ate stuffing with eggs for days Anne but they weren’t as good – or as cute – as these! Great idea! This is such a clever idea! Great recipe Anne. Stuffing is my favorite part of Thanksgiving! 🙂 I always make extra so that there are plenty of left overs. What a great recipe this is for enjoying the already made stuffing in a new and flavorful way! This is the BEST recipe ever for leftover stuffing, Anne! I love it. 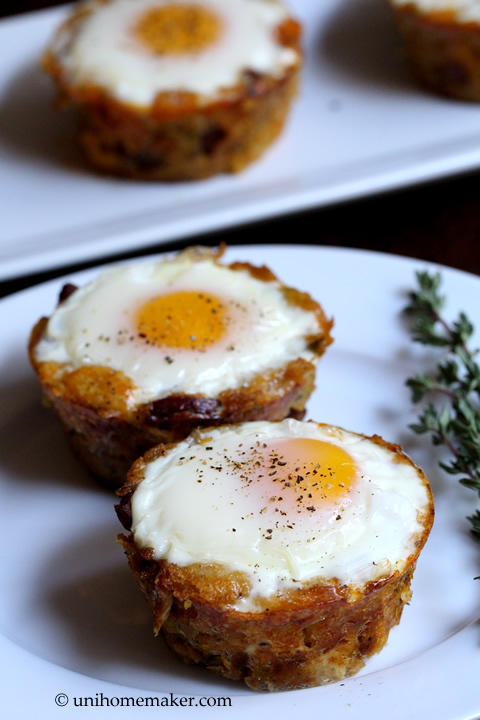 I need to make some stuffing again just so I can make these little breakfast treats. Pinned!